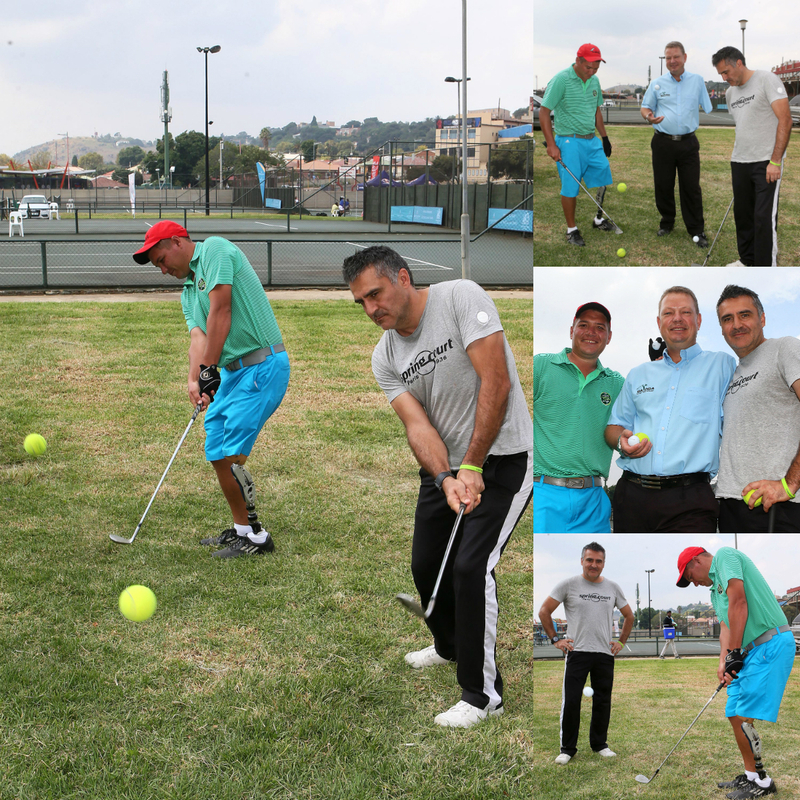 JOHANNESBURG, 15 April 2016 - Who would have guessed that the world’s number one ranked wheelchair tennis player Stephane Houdet would find his golf swing between back-to-back victories on the UNIQLO Wheelchair Tennis Tour in South Africa? It was a casual look at a journalist’s laptop in the media centre during his post-victory interview at the Gauteng Open that stopped Houdet in his tracks. The reason for his excitement was an image on the screen of four-time Nedbank SA Disabled Golf Open champion Daniel Slabbert in mid-swing. Houdet’s request hardly surprised South African Disabled Golf Association CEO Eugene Vorster. “Some people might final it hard to grasp why Stephane would interrupt his bid for a third SA Open title to have a golf lesson with Daniel, but Stephane was the top ranked disabled golfer in Europe and France before he switched his clubs for rackets, balls, lucrative endorsements and prize money,” Vorster said. “In fact, his stiff left leg prevented him from travelling long distance, so he intentionally had the leg amputated above the knee so he could be fitted with a prosthetic. It was during his rehabilitation that he discovered wheelchair tennis and his natural talent for the sport. The lesson between the two SA Open champions was set for midway through the SA Open at Ellis Park Tennis Stadium, sponsored by the Airports Company South Africa. Slabbert found a piece of grass in the parking area next to the courts that was big enough to swing a club and got down to business. It took him less than a minute to pin point the Frenchman’s problem. It took less than five swings for Houdet to master Slabbert’s advice. “That’s the shortest lesson I’ve ever given,” joked Slabbert, a qualified PGA teaching professional, who coaches full-time with former Sunshine Tour champion Patrick O’Brien. “I can’t believe it could be that simple,” said the 45-year-old Houdet. “I’ve watched Gary Player for years and I knew exactly what Daniel meant. I didn’t expect it to work, but it did and it felt so natural, so comfortable. When Houdet won the SA Open for a third time last Sunday, he levelled three challenges at Slabbert. “I did what I came to South Africa to do, Daniel - I have beaten the best in the game,” he said. “So, from one SA Open champion to another I challenge you to do the same at the Nedbank SA Disabled Golf Open Championship. But then you must take your game to the next level. The Nedbank SA Disabled Golf Open Championship takes place from 3-5 May at Zwartkop Country Club in Pretoria. World number one wheelchair tennis ace Stephane Houdet and four-time Nedbank SA Disabled Golf Open champion Daniel Slabbert; credit Reg Caldecott. Four-time Nedbank SA Disabled Golf Open champion Daniel Slabbert and SADGA CEO Eugene Vorster with world number one wheelchair tennis ace Stephane Houdet from France; credit Reg Caldecott.